A beautiful enterprise and initiative, Joy at Work is upcycling tetra packs to create bags, accessories and other fashionable products. Joy At Work is a Bangalore-based enterprise started off by Devika Krishnan. 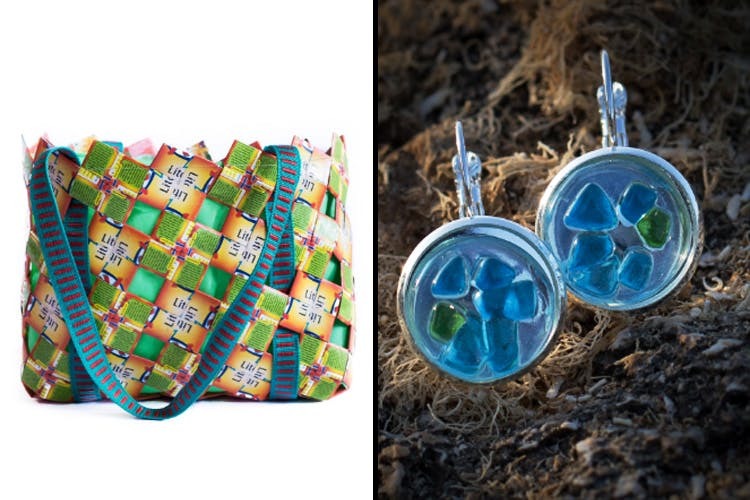 Here they upcycle tetra packs, scrap fabric and cement sacks into gorgeous bags, accessories, and jewellery. Devika always dabbled in numerous social enterprises, including rehabilitating women in Ranthambore where she taught them vocational skills such as embroidery among others things. This in turn gave birth to ‘Joy At Work’ which she started off in Bangalore. She mobilised the women from the nearby slums in Whitefield and taught them embroidery. Then using solid waste like Tetra packs, cement sacks and even scrap fabric they create something beautiful and fashionable. All of the accessories are created using waste that would otherwise find its way into the landfills. In other words, non-recyclable products such as plastic bottles aren’t used here. Find gorgeous bags, neck pieces, embroidered iPad covers, and other upcycled items too. We love that the women are getting a platform to create something so unique, and at the same time are leading the pack to spread awareness about sustainable and responsible fashion. Most of the items are priced between INR 200 to INR 1,000. It’s a conscientious enterprise that is not only empowering women, but also creating products out of things that are unimaginable. You can buy their products from Cannanore at the Inorbit Shopping Mall in Whitefield, or order them here.